A hearty congratulations to our Grand Prize winner, "Donna A." and our two runners-up, "Colleen C." and "Marijane D."! Thank you to all who participated! 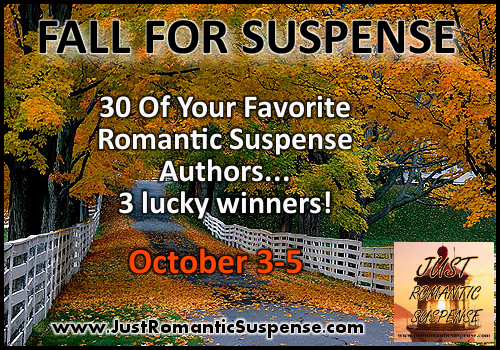 From October 3-5 everyone has an opportunity to FALL FOR SUSPENSE on JUST ROMANTIC SUSPENSE! On October 6th, one grand prize winner will be able to select 10 titles of their choice from the big pile of books. To enter, simply stop by and share one of your favorite aspects of fall, or favorite fall activities! Giveaway ends 11:59pm EST October 5th. Please note the author's individual restrictions. I love the fall colors and the falling leaves! When the kids were younger it meant a trip to the pumpkin patch, corn maze, and pictures in the leaves! I actually like the darker nights and that cool, fall feeling. Great for reading! Awesome contest!!! If I am lucky enough to win it will be a tough choice because I love so many of the listed authors. Thanks for the chance to win! 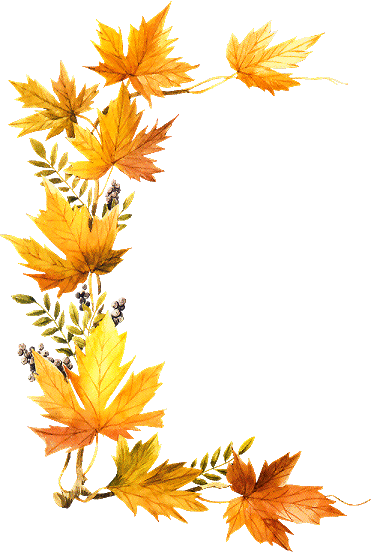 Fall is my favorite time of year also....my Wedding Anniversary is the 27th of October, My Daughter is getting married this year on the 10th. We always go away in October. The crisp days and nights, the leaves....refreshing!!! I would love to win, thank you for the chance! I love fall baking! I rush out and get my pumpkin, apples and all my spices and away I go! Pies, cakes, cookies, breads, you name it I probably bake it. Of course there's Thanksgiving and Christmas to look forward to as well. Love this time of year! I'm a summer fan, but I love going to northern Wisconsin to check out the fall colors. And pumpkin pie. Not that I couldn't make anytime, but fall just feels right! I love the cooler weather and football! Wow. What a generous giveaway. My birthday is in October and almost every year my mom gives me a bag of those mellow creme pumpkins. I used to love them as a young girl so it is just kind of a sentimental sweet thing between my mom and I. I also love wrapping up in a blanket on my porch swing with some hot cocoa and a great book. #Fall is awesome. Enjoy the cooler weather. Anticipation of the coming holidays Christmas (my Mom's favorite ) and Thanksgiving . I love taking pictures of the leaves changing colors. I love fall because of the colors, cool crisp air, hot apple cider, bonfires and relaxing with a good book a cup of hot tea on the porch! Love the comfortable weather and going apple picking and to the pumpkin patch. I love the colors of fall, the crispness in the air and my very favorite thing about fall is that it is PERFEFT tent camping weather! I love to roast sugar pumpkins! the smiles on their faces make all the chills go away, they truely warm your heart! I love the fall foliage and cooler weather. We have snow flurries and gale force winds in northern Minnesota tonight . . . perfect for cuddling up with a good book to read. Thank so much to all of the authors and JRS for these awesome giveaway opportunities!! Cooler weather and those wonderful scent of apple cider, evergreen, and pumpkin pie. My favorite thing about fall is the cooler weather and my favorite fall activity is going to my son's soccer games. Reading is my Fall activity! In interior Alaska fall comes and goes quickly, sometimes in a two-week span. My favorite part, though, is the vibrant color of the leaves and the hint of winter frosting the ground. I love the crispness in the air, the changing colors, and pumpkin spice lattes :) I also love cuddling with my dog, under a warm blanket and a good book! Thanks for sharing! enjoy walking outside more now that the weather is beginning to change. Thanks for the giveaway! Wow! Great bunch of authors!! I love the sweatshirt weather. Just enough chill to make exercise comfortable. The air smells crisp. Thanks to all the authors for sharing with us. I love all the fun pumpkin recipes that come out this time of year! I love going to the park and woods to see the change of colors. There are also great sunsets this time of year. PS: This giveaway is awesome! I love the cooler weather. I think I'm way more productive when the weather turns cold and I do more yard work and house cleaning when the weather takes a turn! I love watching all the animals prepare for colder weather....building nest, gathering nuts and seeds, flying south. I love watching the clouds slide across the sky teasing us with rain. And of course I like the colored leaves and crisp morning breeze. Fall is my favourite season! I love the mild days and cool nights and watching the leaves change colours. Thanks for this giveway. These are perfect for curling up with on those cool nights! I love the cooler temperatures and watching the leaves change colors. Saying goodbye to summer is what I love most about fall. The leaves turning in a riot of colours and the cool, crisp days and evenings.